A clever comedy with a strong cast, Bruce Almighty delivers laughs while probing issues of free will and the natural human proclivity to look out for self-interest prior to appreciating the benefits of the greater good. Baltimore TV reporter Bruce Nolan (Jim Carrey) is desperate to land the position of news anchor. Instead, the station is happy to keep assigning him feel-good community stories to make use of his natural comic talent, and the anchor position goes to his nemesis Evan Baxter (Steve Carell). Feeling extremely sorry for himself and upset at what he perceives to be God's lack of attention to his needs, Bruce is fired for an on-camera melt-down and has a huge fight with his girlfriend Grace (Jennifer Aniston). Bruce receives a mysterious phone number on his pager, and it leads him to an encounter with God (Morgan Freeman) at an abandoned but remarkably well polished building. God gives Bruce a chance to do better at managing life's affairs by providing him with divine powers. Bruce wastes no time in selfishly using these powers to seduce Grace and embarrass Evan, while enhancing his own reporter credentials by uncovering Jimmy Hoffa's grave site. But when it comes to meaningfully helping himself and others, Bruce discovers how difficult it is to fulfill the simplest of human aspirations, even with all the powers of God at his disposal. Bruce Almighty has plenty of bravado, screenwriters Steve Koren, Mark O'Keefe,and Steve Oedekerk not satisfied at portraying God but going further and finding plenty of comic material in exploring what happens to mere mortals when provided with God-like powers. The comic elements mesh well with the message of taking personal responsibility before whining about divine failure. Director Tom Shadyac uses a light touch to mix the ingredients, the comedy remaining brisk and the lessons inferred rather than hammered. Jim Carrey co-produced Bruce Almighty, and plays Bruce with just a touch of hysterical God-blame, enough to provide leeway for some classic moments of Carrey physical comedy. And when he does obtain God's powers, Bruce defaults to the expected behaviour from a man with a large chip on his shoulder, fixing what he perceives to be the wrongs in his life prior to even noticing what anyone else may need. In support, Steve Carell, in one of earliest screen roles, demonstrates plenty of the comic potential that would catapult him into his own starring roles. Jennifer Aniston is confined to the typical, underdeveloped cute girlfriend role, Grace never explaining why she is hanging out with a Bruce who is initially so filled with negative hate towards his life. 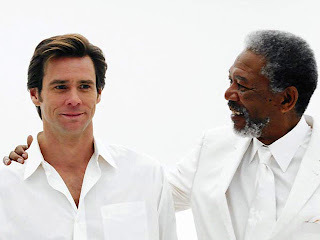 There is no more distinguished and capable actor to play God than Morgan Freeman, and he adds plenty of class to Bruce Almighty with a performance emphasizing benevolence with just a hint of mischievousness. Bruce Almighty has the power to entertain, and uses it wisely.